Discussion in 'Cases & Case Modding' started by Morphes, Aug 3, 2018.
currently no motherboard RGB, but most likely it will be an asus board when I choose. 1) What is your favorite software for lighting and why? 2) Favorite hardware with the software? 3) Is it possible to add non brand specific hardware? Open to suggestions! Thanks in advance! I have used NZXT Cam, ASUS AuraSync, and Corsair iCUE software. My preference for system monitoring was NZXT Cam - easy to read at a glance and easy to use. I also tried ASUS AuraSync but I was never happy with it. It was tough to get it to install successfully and not very user friendly. 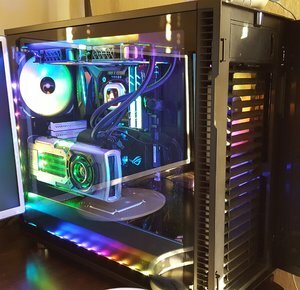 When I switched to RGB fans I went for the Corsair ecosystem and their ML series fans. 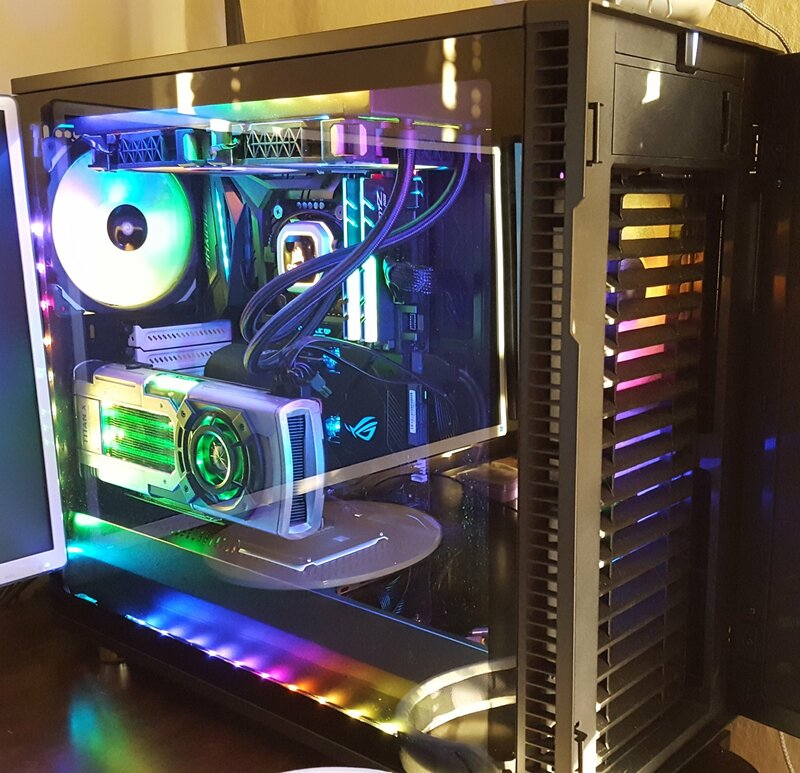 My system has an H115i Pro 280mm AIO, 6 ML140 RGB fans, a Commander Pro, and a Lighting Pro Expansion kit (4 RGB LED strips with extensions). The iCUE software itself is very easy to use for lighting control and can capture a lot of system info (temps and RPM), but the information is not displayed as well as NZXT's software does. iCUE has a lot of preconfigured lighting profiles and allows for the creation of custom templates. Corsair has done a great job of combing their 2 previous programs into 1 and making it easier to use. When the fans are plugged into the hubs in order it makes sequencing of the RGBs very easy to get cascading and color shift patterns to run through your case. 2. Wiring, every component has at least 2 leads, one for function and one for lighting. Wire management is a PITA. Your fan leads plug into the Commander Pro or directly to the motherboard fan headers (your choice, depending on if you want BIOS or iCUE control - I have had no issue with either setup) and then your RGB leads from each component plug into the LED hub, which then plugs into the Commander Pro or a Lighting Node Pro, which then gets plugged into SATA power and to a USB 2.0 connection. The RGB strips are much easier, daisy chain them together and then plug them in to a Lighting Node Pro or Commander Pro. Using iCUE you can chain up to 6 strips at a time, with the older software, Corsair Link, you can chain 4. 3. If your motherboard is limited on USB 2.0 headers then you will need something like the NZXT internal USB Hub or Corsair Commander Pro - which acts as a USB hub and control node for the Corsair products. After the sticker shock wore off and I got everything into my case I really liked the performance and look of what I have. The main thing for RGB is decide on the look you want - Thermaltake, Corsair, Cooler Master, Enermax, NZXT, Deepcool, and others all have unique looks to their RGB fans. Then price out the number of components you need. I have not tried mix and match for components. Some of my pre-purchase research showed that some RGB components don't play well with others (pinouts on connections not matching between brands etc.). I own the Asus Rampage VIE and "supposedly" one of its features was great RGB control through Aura Sync. 1) My 4X Sticks of Trident Z RGB (AURA certified) never works correctly (1 DIMM off, not in sycn) so I had to completely desynv it and set it to RAINBOW gradient mode. 3) Phanteks 1080Ti GPU waterblock leds + various other strips + CPU waterblock work in sync with color cycle. Besides the lack of proper syncing the software lacks proper control and to cut a long story short I just don't care anymore. Not to mention what happens if anyone tries to sync Philips Hue lamps in their house with AURA (featured support)..
Have a look at the ASUS ROG forum / software section and you will see what I mean. In general there is a huge outcry for every piece of software that comes with Asus motherboards and they are doing nothing about it. My next take will be with Corsair since looking at iCue (I have it for my PSU) it looks promising however my fancy high end Rampage VIE will have to be out of sync. I completely agree. AURA is useless. My ASUS board is great for stability and features with an easy to use and navigate BIOS but AURA can die a quiet death. While I wish GSkill memory worked with iCUE I also understand why Corsair would want to push you toward their brand of memory.